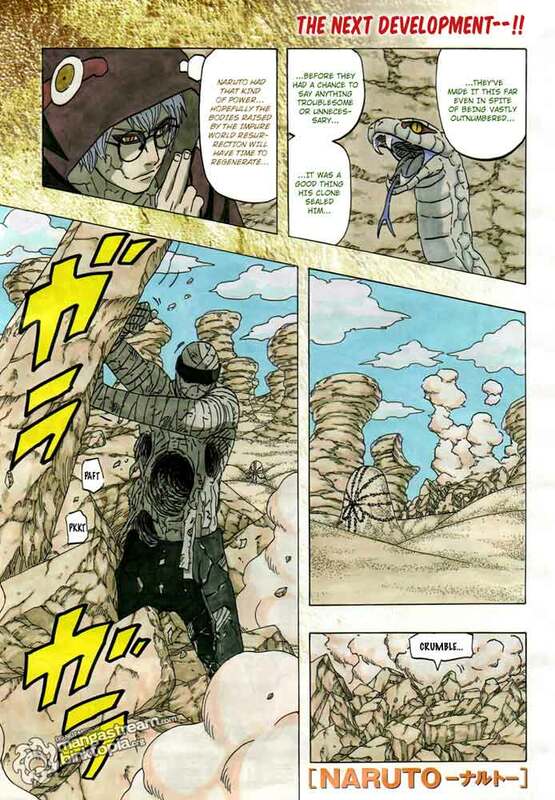 During battle bettween Gaara and Mizukage, Naruto and the others did not realize that Muu Sama (previous Tsuchikage) have split his body into two before Naruto's attack hit him. Now he is trying to get his half body by take of the seal. The squad join army became unaware of dangerous situation because of their victory againts the predecessors of the five kage did well. While waiting the next orders from HQ, they recover the wounded and preparing for the next move. In other place, Naruto's original body and the clones all headed to the the frontlines of each battlefields. And he eventually reached where shikamaru and others are. By using his ability, Naruto help to identify the enemy which has transformed resemble with the army and smash them one by one. He save Sakura, Hinata and the others on the right time. As the tide of battle shifts for the better, what is Muu up to within the shadows?